How many books on Chernobyl are there? Dozens, so why take the time, let alone publish another? Here then is the rare perfect response: a page-turning, complicated yet unraveled mystery of all the components, carefully researched, fully annotated, and always professional. Some might say that narrative nonfiction borders on novelization and, indeed, parts of this story are so fantastic the reader may well assume (wrongly) that those parts are fiction. They are not, the book is not, and the author is a certified crazy person for accomplishing such a dedicated and remarkable feat. It is vital he investigated—hindsight presenting facts and evidence not previously apparent to most (or at least not in one place for all to peruse). It is similarly vital the author constructed this tale of overall woe as a page-turning mystery unraveled since the people who should read it—politicians and civil servants—would never be able to understand the tapestry of circumstance, ineptitude, error, goofs, and heroics without having the luxury of a tale well told. Turning the page here is to come to understand. A tale that is complete, replete with in-depth examples of characterization, descriptive of events and consequences, if no easy feat for any author but here, given the complexity of the true story, the author has shown a mastery of the craft without ever losing sight of the message—now only really visible two decades later—that man’s hubris at building and poorly maintaining such a facility as a nuclear reactor will inevitably lead to a catastrophe permanently erasing a 30km circle for human, animal, or natural habitation for the long foreseeable future. Here, too, are the human interest stories, families moving with scant suitcases for what they thought was a short evacuation only to find they were never to return home. Here also are the families of workers wondering why fathers and mothers died, some quickly from radiation overdose, some lingering for years before succumbing. And where are all the other evacuees, are they all accounted for? No, they are spread out across what was the USSR, where they slowly “catch” diseases directly caused by the Chernobyl disaster. Statistics unattributed. This book isn’t after all, a historical treatise or a government report, it is an all-too-human look—always with factual clarity and revelation—at the unfolded events and the consequences, most of which the reader may think they are familiar with. But not. Here are the people—often revealed in almost door-to-door interviewing by the author—now sad, once hopeful, happy, endowed with special privilege in the Soviet Union who found their world upended, never to return again. 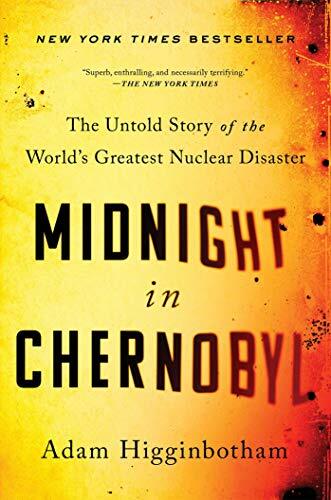 And those stories are told with excellent journalism at the heart of what is, in the end, a blinding work of narrative fact that will amaze, enthrall, and, yes, cause every reader to shed tears for the residue of suffering that Chernobyl has left to all humanity. Peter Riva is a staff reviewer at New York Journal of Books.